Images courtesy of Leigh Gazzard. UNSW Eastern Suburbs Bulldogs vs. Pennant Hills Demons – Village Green on Saturday, April 6, 2019. After one of the longest and hottest summers in memory, it was great to be back. If you can’t be optimistic in the lead-up to Round One, you never will, and across this massive city, footballers travelled to their opening round venues enthused about the possibilities of the season to come. Five opening round matches in the Men’s Premier Division competition were played on Saturday afternoon. Rain during the week had softened the grounds, but the day dawned sunny and warmer than normal – the stamina of the players was tested in the warm and sticky conditions. The first game to get underway was at the Village Green, as defending Premiers UNSW-ES Bulldogs played host to Pennant Hills Demons. The Bulldogs, back at their spiritual home on campus, unfurled their premiership flag to the delight of their club faithful. With a team further bolstered by some handy recruits and some graduates from their Under 19s Premiership side, the Bulldogs have high hopes of going back-to-back. Though, their first step was to get over Pennant Hills. The Demons weren’t going to be easy opponents. Last year was the first time in well over a decade they had missed the finals. If they had kicked one more goal, they would have made it, that’s how close it was. They were coming in hungry, determined, and had kept their big-name players from last year. It was the defending champions who would bolt out of the pack, controlling proceedings from the first bounce. 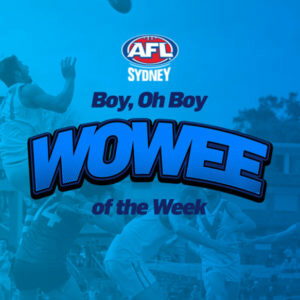 Some impressive finishes on the forward line made every post a winner, as the Bulldogs slammed through seven straight goals in the first term. This was a talented, well-drilled side going through their paces and showing their intentions for the season to come. The Demons did well to stop the bleeding after the early goals flowed the Bulldogs’ way, and against the run of play they managed to put three goals through the big sticks. Still, the Bulldogs enjoyed a 23-point lead at the first change. It had been an impressive opening by the Bulldogs and the Demons knew they would have work to do if they were to get back into this contest. They gave it a good shake in the second term, getting more of the ball and tightening up in defence to deny the Bulldogs the space they had enjoyed in the first term. Their attempts to pull the margin in would come to naught as the Bulldogs found the answering goals. A quarter of three goals apiece saw the margin cut to 21 points, and a game that could have been a blow-out at quarter time was looking a tighter contest. No one could have seen the third term coming. When the teams emerged from the rooms for the premiership quarter, it was the Demons who came out full of running, and the Bulldogs who found themselves on the defensive. Demon runners, who had been well held in the first-half, were shaking off the attention and presenting themselves as running targets. The marking power in the forward line stepped up, and the deficit on the scoreboard was being noticeably eroded. Three times the Bulldogs defied the pressure to add goals to their buffer, but the Demons kept chipping away. 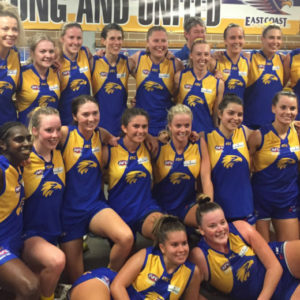 In the dying stages of the quarter, their seventh goal for the term gave them an unlikely five-point lead at three-quarter time. Suddenly, the risk of the Demons spoiling the premiership party was all too real. The Bulldogs had to stop the Demon momentum, to dig deep and defend grimly. When the crunch was on, the Bulldogs were able to achieve that. The Demons were held to a single goal in the final term, while three Bulldog goals were just enough to get them over the line. 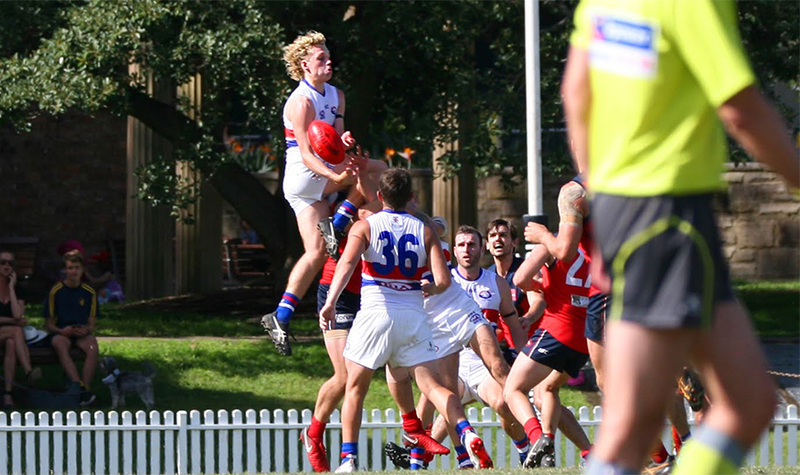 With only ten points in it, the Bulldogs had been given a solid test on the day. Charlie Burgess-Hoar was a standout on the forward line for the Bulldogs to finish with five goals, while Jesse Aish, fresh from his heroics in the dying moments of last year’s Grand Final, weighed in with four. Hayden Nichols, Burgess-Hoar and Nicholas McGann featured prominently around the ground for the Bulldogs. They had been tested by the Demons, and leaked plenty of goals during the Demon fightback in the third term. But in the end, they got it done. Theo Moraitis was a handy target up forward for Pennant Hills to finish with four goals – a welcome return to the field after missing all last year through injury. Around the ground they received solid service from Jackson Preedy, Ranga Ediriwickrama and Josh Boag. It had been a brave fight for the Demons, particularly during their third quarter revival. In the end they weren’t able to get the points and will be rueing their slow start. There were plenty of positives for the Demons to take out of this performance as they showed they can still match it with the best sides in this competition.